DETAILS: With polka dots all the rage, our new Personalized Polka Dots Aluminum Water Bottle is a fashionable way for her to stay hydrated. Available in six dazzling colors to match any personality, this 20 ounce bottle's design is contemporary and eye-catching yet classy and suitable for a variety of activities. Bottle features a leak-proof screw-on lid with attached carabiner. PERSONALIZATION: Select bottle color and personalize with two lines of up to 15 characters per line. 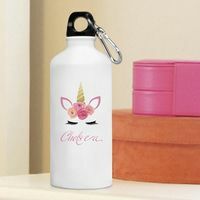 MARKETING: Don't miss the opportunity to brighten someone's day with a personalized polka-dotted water bottle! This eco-friendly, sleek aluminum container with personalization is a smart choice over bottled water that will encourage youngsters to consume more water over sweet carbonated drinks. Attached to the screw-on-lid is a carabiner clip, a valuable feature of this personalized travel gear.